Wellness with Penny | Empower Yourself From The Inside Out: Are you as authentic as you think you are? We live in a world where everything that exists (yes, including emotions) is made up of energy, and therefore, exudes a certain vibrational frequency on an energetic level; hence, the "energy" you exude from the way you feel as you're speaking is more important than the thing you are actually saying. In other words, your "core" intentions are more powerful than the words you utter. It is your "core" feelings that will attract more of the same into your life. For example: even though you're saying "nice things," but deep down you're resentful and speaking from a place of anger, you will only attract more anger to you one way or another. 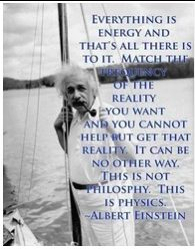 So you see, we cannot "trick" this energy field that surrounds us by "saying" one thing, but "feeling" another. This energy created from our "feeling" is precise, constant, and always in one way or another, giving us back exactly the "intentions" we exude regardless of the words we utter to express or impress. So in order to attract more of what you want in life, perhaps it would be wise to be authentic... say what you feel and feel what you say. Click here to read more: Law of Attraction: What is it and how can you make it work for you?